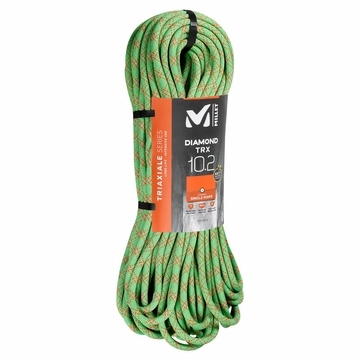 "This is the rope for intensive usage: a dynamic climbing rope for clubs and indoor venues. Its the rope for beginners: it handles well and is very reassuring. With its generous diameter, it contains more material and is thus undeniably more robust, and more resistant over time. This Diamond is also a Triaxiale model that's what the renowned TRX in its name stands for. Its a special, and totally exclusive way of making the rope core, explains Michel Paccalet, Millet's ropes product manager. This manufacturing process requires machines that are able to braid the cores and not just to twist the polyamide threads. These inner braids of which there are many in a 10.2 mm diameter rope protect the core threads from internal abrasion. Yes a rope wears out gradually, from the inside. What does Triaxiale mean, Michel Paccalet (Millet product manager) Its a manufacturing process requiring machines that are able to braid the cores and not just to twist the polyamide threads. These braids protect the core threads from internal abrasion. That's because ropes wear out gradually from the inside. And a rope is the life line that unites the members of a climbing team. A dynamic rope absorbs impacts, and therefore enables safe falls, which are fairly inevitable in climbing. In the mountains, ropes are put to a very tough test: abrasion on granite, sharp rocky artes, rope-jamming cracks while rappelling, trickling ice, falling stones Your safety depends on its strength. To make sure the link lasts, Millet's exclusive Triaxiale construction guarantees outstanding longevity for your mountain life line.